To Cite: Cho Y H, Ahn K, Kang C H, Kim C H. Calcifying Aponeurotic Fibroma of the Dorsum of the Foot: Radiographic and Magnetic Resonance Imaging Findings in a Four-Year-Old Boy, Iran J Radiol. 2015 ; 12(2):e23911. doi: 10.5812/iranjradiol.23911. Calcifying aponeurotic fibroma (CAF) is a rare, benign fibroblastic tumor that typically occurs in the palms of the hands and soles of the feet, in children and adolescents. Due to its infiltrative nature, this tumor can mimic malignancy on preoperative magnetic resonance imaging (MRI) and has a predilection for local recurrence. There are very few reports in the literature that describe features of CAF on MRI, especially those arising in the foot. We present an unusual case of a CAF affecting the dorsum of the foot in a four-year-old boy. Calcifying aponeurotic fibroma (CAF), also known as juvenile aponeurotic fibroma, is a rare, slow-growing, benign soft tissue tumor that most commonly involves the deep volar fascia, tendons, and aponeuroses of the hands, followed by those of the feet (1, 2). It typically occurs in children and adolescents. However, recent reports have shown a wider age distribution (2). The tumors are locally invasive and have a predilection for local recurrence after surgical excision (1, 2). Although magnetic resonance imaging (MRI) is useful for the differential diagnosis and preoperative planning, there are only a limited reports describing the MRI features of this rare tumor, especially those arising in the foot (2, 3). We thereby report the radiographic and MRI findings of a CAF that occurred on the dorsum of the foot, in a four-year-old boy. A four-year-old boy was referred to our institution for a palpable mass on the dorsum of left foot that was found incidentally by his mother, 4 days prior. He had no history of trauma. Physical examination revealed an approximately 2 × 2 cm in diameter, hard, immobile, painless mass, located above the left fourth metatarsophalangeal joint. The mass did not limit range of motion and there was no sign of infection. 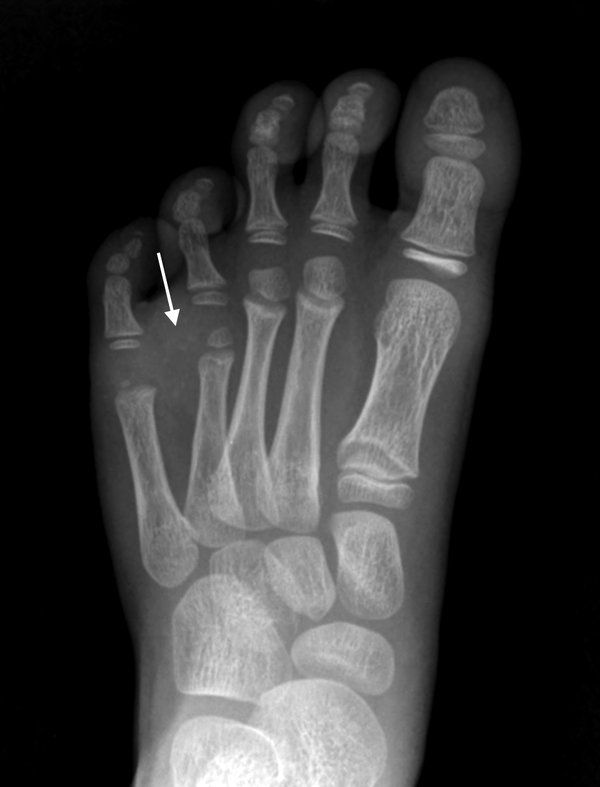 Radiographs showed a mass-like opacity, with faint calcifications, that appeared to be widening the fourth intermetatarsal space (Figure 1). The MRI demonstrated an approximately 2 × 2 cm mass, encasing the third and fourth extensor tendons and adjacent vessels. The margin of the mass was infiltrative and irregular, at the dorsal subcutis, and nodular and well-defined, at the intermetatarsal area around the fourth metatarsal bone. Osseous involvement was not evident. The mass showed heterogeneous high signal intensity on T2-weighted fat-suppressed images and intermediate signal intensity, compared to that of muscle, on T1-weighted images, with strong enhancement (Figure 2). The differential diagnosis, based on MRI, included tenosynovial giant cell tumor, fibromatosis, or malignancies, such as synovial sarcoma and clear cell sarcoma. At surgery, a hard, nodular, gray-white mass was found, firmly attached to the adjacent extensor tendons and fourth metatarsophalangeal joint capsule. On intraoperative frozen biopsy, benign spindle cell tumor was suspected, and a marginal excision was performed. 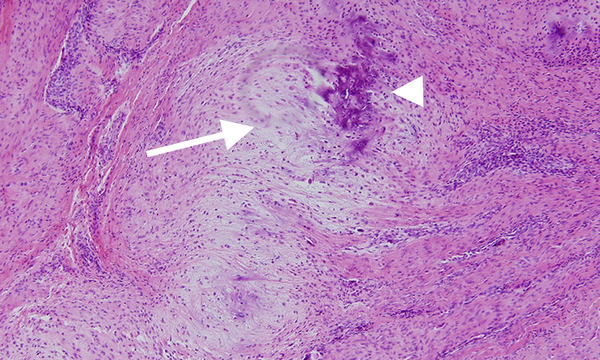 Histologic analysis revealed scattered foci of calcification, surrounded by chondroid differentiation and spindle-shaped fibroblastic proliferation, with abnormal fibroblasts (Figure 3), and the mass was diagnosed as a CAF. The patient was discharged after 1 week, without any postoperative complications. There was no evidence of local recurrence on physical and radiographic examination at a follow-up visit, one year after surgery. Figure 1. A four-year-old boy with a incidentally found mass on the dorsum of left foot. Radiograph of the left foot shows a soft tissue density, with faint stippled calcifications between the fourth and fifth metatarsal bones. Figure 2. Magnetic resonance imaging of the tumor. The tumor shows: A, high signal intensity on T2-weighted images; B, intermediate signal intensity on T1-weighted images; C, intense contrast enhancement. Note the infiltrative and ill-defined margin at subcutis (arrows) and nodular and well-defined margin at the intermetatarsal space (arrow heads). Figure 3. Microphotography examination (× 100) revealed focal chondroid differentiation (arrow), with central calcification (arrow head), surrounded by spindle cell proliferation. Although CAF is categorized as a benign fibroblastic tumor, it has a locally invasive nature and local recurrence after resection is common (1, 2). The tumor typically manifests in the palms and soles of hands and feet, in children and young adolescents. Males are affected twice as commonly as females. Clinically, this tumor manifests as a slow-growing, hard, painless palpable mass and rarely exceeds 3 cm in diameter (2). Conservative surgical resection is the treatment of choice. Histologic examination is necessary to establish the diagnosis. On gross examination, the tumor typically appears as a gray-white nodular or infiltrative neoplasm, closely related to tendon, fascia, or aponeurosis. Microscopically, CAF is characterized by variable degree of scattered foci of calcification and chondroid areas, surrounded by palisading plump fibroblasts (1). On radiography, CAF appears as a soft tissue mass, with or without fine stippled calcification (2, 3). Signs of bone involvement on radiograph, such as scalloping of the cortex and adjacent bone erosion, may be seen (4, 5). However, radiography is not sufficient for developing a differential diagnosis. The MRI is the best modality for evaluating soft tissue tumors of the foot, due to its ability to show signal intensity, extent, and margin of the lesion. The signal intensity of CAF was reported to present like heterogeneous mixtures of high and low signal intensity on T2-weighted images, and intermediate on T1-weighted images, with intense contrast enhancement (3, 4). However, Kwak et al. (6) described one case of CAF in the thigh of a 4-year-old boy that had solely low signal intensity on T2-weighted images. It seems that the degree of calcification and fibrous component influence the T2-weigted signal characteristics (4, 6). Although the margins of the CAF can be described as infiltrative or well-defined on MRI (3); This may depend on the phase of the tumor, as suggested by Enzinger and Weiss (7). In the initial phase, which is seen more often in young patients, the tumor shows infiltrative growth and often lacks calcification, whereas in the late phase, the tumor becomes more compact and nodular, with more prominent calcification. We found only two cases in the literature that described the MRI features of CAF of the foot, and both of them occurred in the sole of the foot (2, 3). Furthermore, they all exhibited well-defined margin or nodular contour. In our case, however, the upper margin of the tumor in the subcutis was infiltrative and ill-defined, while the lower margin, in the inter-metatarsal space, was relatively nodular and well-defined, appearing to have characteristics of both the initial and late phase. The differential diagnosis for CAF may differ depending on patient age, lesion location, presence of calcification, and osseous involvement. In our case, the differential diagnosis included tenosynovial giant cell tumor, fibromatosis, and soft tissue sarcoma. Tenosynovial giant cell tumor is the most common tumor of the toe. However, it rarely occurs in children and calcification is uncommon. On MRI, the tenosynovial giant cell tumor has a lobulated appearance with well-defined margins and heterogeneous low signal intensity on T1- and T2-weighted images, mainly due to hemosiderin deposition. Pressure erosion of adjacent bone is relatively common (3, 8). Various forms of fibromatosis can have clinical and radiologic findings similar to CAF. Fibromatosis can appear with both infiltrative and well-defined margins and contain low signal intensity bands on T2-weighted images, which represent the dense collagen component, although this tumor is rare in children. Demographic and clinical information, in addition to imaging, should support the differential diagnosis (2, 8). Although malignant tumors rarely occur in the foot, synovial sarcoma or clear cell sarcoma should be considered. They are sometimes misdiagnosed as a benign tumor, due to their slow clinical course and relatively well-defined margin. However, intralesional hemorrhage can be helpful for suspecting synovial sarcoma (8, 9), and clear cell sarcoma may show high signal intensity on T1-weighted image, due to melanocytic differentiation (3). In summary, in the case of a soft tissue tumor with infiltrative margin, which involves the fascia or tendon of the foot in children, CAF should be considered in the differential diagnosis. Even though the MRI evaluation of the tumor margin and the signal characteristics are useful, they may differ according to the phase of the disease. Extensive knowledge of the imaging findings of this uncommon tumor can facilitate the correct diagnosis.